This is the key here. If they manage to revamp the game as something reasonably priced, then I'm sure it will be a great (or at least moderate) success. However if they keep the same pricing tactics that brought The Hobbit to its current comatose state... it won't. Progress is like a herd of pigs: everybody is interested in the produced benefits, but nobody wants to deal with all the resulting gak. GW customers deserve every bit of outrageous princing they get. That is true. I think the most we can hope for is some decent Start Collecting sets and bundles. But that would be a hell of a lot better than nothing! Can't wait to be able to the source books i need. Yeah, actually, that's something I will pick up straight away. Was kicking myself for not getting them when they were available. And maybe a re-branding away from the generally not-well-received Hobbit films to "Middle Earth" and more focus on the LOTR end of things would help rekindle interest too. Yeah, The Hobbit is OK, but LOTR and the events pre-Hobbit are more interesting. A move away from the Hobbit pricing might be a better idea! That too. Absurdly overpriced models. More so than AoS and 40k which says a lot. I've been waiting for this for SO LONG. Got my fingers crossed for a more in depth ruin of Arnor supplement focusing on the fall of the ancient Kingdom of Arthedain and the war against Angmar, vs the present day Rangers of the North. 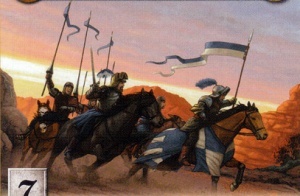 Some new options for Arnor would be nice - light cavalry similar to Knights of Minas Tirth (something like the image below), Royal Guards of Arnor, militia etc. 1. What is the model count of the game, generally? I know the individual unit incarnation of the game appealed to me, but I guess it was concurrently a larger scale/movement-tray based game? 2. Are there any ways get a copy of the rules digitally? I'd love to read up on how the game actually plays, but I am sure it predates GW selling digital rule-books. Problem is, as a disabled gamer, digital books just make my life much, much easier. To answer the first question, it actually scales really well; you can play a small skirmish with a dozen models per side and it'll be just as fun as a sprawling battle with 80+ models under each player, without needing to get into the alternate unit-based War of the Ring rules (for the really, really big battles, 100+ models minimum!). Generally, 500-750 points a side is played, which is typically between 30 and 60 models depending on the army. Sadly, the rules can't be had digitally for some reason, maybe they will finally sort that to coincide with the reprints. Model count varies wildly. An average list in an average size game of 600pts or so might be around 30 models. Another list might include all monsters or heroes with as few as 2 or 3 models. And some lists might be a horde army (Goblin Town) with 50 to 100 models. All are viable and fun. All hero or all monster lists are challenging to play but very powerful in the hands of players who know what they're doing. You really can do whatever you like. As for digital rules, no they're not available digitally so far as I know, but there are rumours and a leaked announcement from throne of skulls suggesting that the books will soon be rereleased in print format and in digital format for the first time in the near future. In the meantime, PDF torrents are easy enough to find on the internet and only TFG rules lawyers will protest about it, the average player in a friendly gaming context will accept it. You can't play the game without the books and if the books are no longer on sale you can't get them. I'd rather play with a player who downloaded some illegal torrent PDFs than have no opponents whatsoever. Just don't take a printed out PDF into a gw store, that would be taking the mick and pushing your luck. Man this is awesome! Especially if they plan on re-releasing older OOP models again. I really would like to get Gildor Inglorion without breaking the damn bank. Good to see some life in the old dog yet! I got out of formally supporting the game when the prices doubled at the start of 2012 - in hindsight possibly a mistake, as the last round of army books seem to have been balanced especially well. The army book prices still don't sit well with me though, and I'm torn whether to buy them on re-release. I have picked up some of the Hobbit range and the book on eBay. They really are lovely models, but again, too expensive to justify building an army to myself. Happy with the core rules as they are - the Hobbit rulebook clarifies and defines everything nicely but the additional rules for different weapons and monster attacks add little for me. I'd actually far rather see the game take some new and interesting directions - campaign rules have always been top of the list for me. Maybe some structured rules for your own "Fellowship" of adventurers, bringing the game on from Battle Companies. We've toyed with doing a Vale of Anduin or or East of Mirkwood campaign based on the Dux Britanniarum game - space for Northmen tribes, invaders from the East, Gondorian outposts, orcs, dwarves, elves and even Hobbits. What excites me the most is an exploration of the source material in the appendices - they "done good" with Harad, although I always felt the Arnor supplement was a bit thin. There's a LOT left to explore in Middle-Earth, and plenty of times when the setting looks very different. The Kin-strife, Gondor's wars in the East, an extended take on the fall of Arnor and the three Kingdoms. If they're part of the liecence, the wars of Numenor and Sauron's war on the Elves during the Second Age too. The old MERP RPG was set in TA 1640, just after the Great Plague - a setting subtly different but just as empty as the late Third Age. I think it would be foolish if they re-do this line they don't re-release the mines of moria set. I personall think it was far better than escape from goblin town, models and ajccessory wise. Thanks for the info. A cursory look hasn't yielded anything for me, but I did just Ebay a physical rulebook of the "One Book to Rule them All" edition people seem to like. I just wish I could find a pdf because physical hardcovers are difficult for me. Oof. My Uruk army has been dead for many years and restarting it is not really on the table. I hope this is good though, for nostalgia if nothing else. Edit: By the way, and I wrong in thinking this 2005 book is the best of the "rule-books" to own? I see on wikis people praise it, but now I hear the Hobbit big book is actually a more up to date core rulebook? I still swear by the 2005 big book for newcomers to the game. It can be had very cheaply, it has what I think are the best edition of the core rules (most of the later changes made in the Hobbit big book I'm not a huge fan of) and crucially, has functional army lists with points and profiles for pretty much every army out there, at least in some capacity. There are a couple dozen profiles that came out between that and the 5 current Sourcebooks, but if you're looking to get started with the game, won't be playing pick-up games with strangers and want to get a feel for how the various armies play, you really can't go wrong. You'll obviously want the Hobbit book (I suggest the mini book from the Goblin Town set) if you want to do anything 'official', but since that's lacking in profiles (only the stuff from the first Hobbit movie is in there) I think it is much less useful for a beginner. To me, the One Ring rulebook you're talking about is the best. But I never switched to the Hobbit which I don't really see as an improvement to the system so YMMV. Since the One Ring book is out of print, is PDFing it okay? Because you can find pdfs of a lot of these books (of varying quality) on Scribd. So, as a general question... if i'm Ebaying up books for the moment... what books ended up having new profiles, etc? I see sooooo many books, some of which seem faction specific, others more general. There are an overwhelming number of books for this game, and if you're unfamiliar with it, it is intimidating. I never understood why GW jumped on the Hobbit. It feels absurd to base a strategic wargame on a happy adventure story (with the exception of the last movie). They believed Hobbit would be the same bestseller like Lotr while the Movie Hype. They believed Hobbit would be the same beststeller like Lotr while the Movie Hype. And simultaneously thought they would get the same returns without putting in the same amount of effort as they did for LOTR. For one thing, I love this game. I've got a substantial Gondor army painted up, and a lead/plastic pile of orcs waiting for a reason. This is probably my favorite Games Workshop ruleset since Epic or Warhammer Quest. But on the other hand, they already priced me out of it when they cut the number of sprues in the plastic boxes in half, dropped the price by less than half, then raised the prices back to the original RRP in just 3-4 years. I somehow doubt this revitalization will bring the prices back down to the sane levels pre-2008 or 2009, whenever that happened. Liked I said, mixed feelings. I imagine some really neat stuff will come out over the next four years, but I also doubt it will be priced competitively with the other mini games I'm into right now. Also worth getting if you see them cheap are the Fellowship, Towers and Return Journey Books, if you want a bunch of cool scenarios based on the books/films, and the blue book mentioned before. I picked up 5 sets of goblins for £20 on eBay a few years back. They are lovely models - detailed, characterful and hardly a mouldline on them. Great for post-apoc mutants, and I plan to use the last sprue as Ghar Outcasts for Gates of Antares. It's just sad that they're a terrible design for high fantasy goblins - not GW's fault in this case. These have the same set of standard scenarios and "warband" army builder (you must have 1 hero for every 12 troops). They all have similar blue covers. Edit: yeah, what Paradigm said! An Unexpected Journey stats are still on the Black Library FAQ page under "Heroes and Villains of Middle-Earth"
Legions of Middle Earth - just army lists and some standard scenarios, not many actual stats. Fall of the Necromancer (Wood Elves, White Council, Dol Guldur). The scenarios in here are often very small scale - a couple of characters against waves of attackers in one, IIRC - and show a different side of the game. There are also three journeybooks, named after the films - of the three, Two Towers is most interesting as it expands the Isengard list. Apologies for any errors - all from my aged memory!